We get more compliments on this personalized dog collar! The phone number can be easily seen from far away, and is especially useful if you have a wiggly dog! If your dog gets out of your yard, can he get back home safely? The dog in this photo has "escaped" a few times. She thinks it's game: get out and then run as fast as possible to anywhere else but home. She knows that someone will come looking for her, so it becomes a game of tag, where she stands just out of reach! She is very fast, and if you run towards her, she bolts in another direction. You have to give up and let her see you start walking away. Then she will artfully follow, just out of reach, because you may turn around and begin the game again. She is smart, but unfortunately does not understand that while running in the street is fun, it can be dangerous. She has had several close calls. 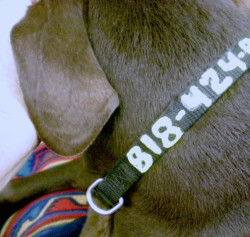 Her owner loves dog crafts and diy crafts and created this custom dog collar so that the phone number can be easily seen and read by a passerby. She gave up on dog tags because her other dog loves to pull those off. 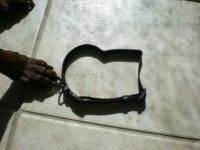 Leather dog collars with riveted metal plates only offered wording that is small and hard to read requiring someone to get up close and personal with a strange dog who may not sit still. Nylon collars offered numbers placed on by heat transfer which would probably easily rub off. Embroidered numbers that were white would be hard to read if they were dirty. Although the embroidered and nylon collars came in beautiful colors, the whole purpose is not to make a fashion statement, but to make it as easy as possible for someone to return a lost dog to its owner. Plus, these collars were expensive for something that was not at all practical. To do this dog craft. start with a black, dark blue or purple nylon collar. You want a dark background. Get a tube of neon yellow 3D paint and a tube of glow in the dark yellow 3D paint from a craft store. This is the paint used to "paint" on clothing. By the way, it is impossible to find a stencil or template for numbers! Letters, designs, stuff you've never dreamed of is rampant. But not one stencil for numbers. So the numbers were applied free-hand. Voila! 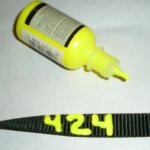 A personalized dog collar with the numbers large and bright enough to be seen. Making custom collars is also good kids craft ideas. We get compliments all the time and other dog owners comment on what a great idea this is.